INDUSTRY.co.id - Manado - The 2018 PRIMA Awards Network Awards are held at the Four Points Hotel Manado, Thursday (08/30/2018). 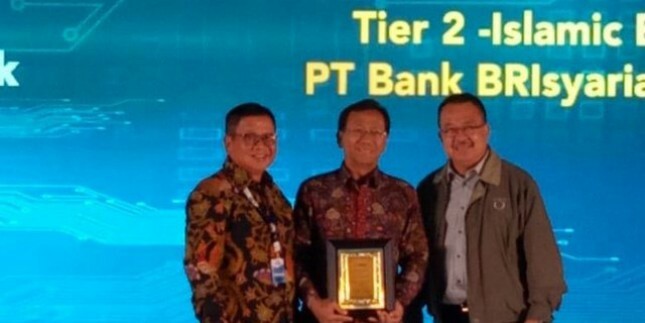 In this event PT Bank BRISyariah Tbk won at the same time four awards for the "2018 PRIMA Awards Network" category for Best Acquirer Bank Category Tier 2 Islamic Bank; Best Issuer Bank Category Tier 2 Islamic Bank; The Highest E-Channel Transactions Bank Category Tier 2 Islamic Bank; & 2nd Best Transaction Growth as Acquirer Bank from Prima Network. The award was received by the Director of Retail Business of PT Bank BRIsyariah Tbk Widodo Januarso. This event is a form of appreciation from PT Rintis Sejahtera for the efficient level and accessibility of banks and billers of Prima Network partners. This activity is also an effort to support the National Payment Gate program (GPN) and cashless society initiatives initiated by Bank Indonesia (BI) and the government. The assessment is based on three approaches in the study of Transactional Banking 2018, namely the quantity approach (number of transactions), speed approach (speed of implementation and certification), and approach to growth (transaction growth). First, the quantity approach. This approach is to measure how much transactions customers make using ATM, ATM / debit, EDC, or non-ATM (e-channel). Of the 17 categories rated, there are 10 categories that use the quantity approach. Second, speed approach. This approach is to measure how quickly a new bank becomes a partner of the PRIMA Network in the implementation of the features of the PRIMA Network and how fast it can get certification. Third, the growth approach. This approach is to measure how high the transaction growth is in the use of ATM cards, ATM / debit, EDC, and e-channels. "This award serves as an encouragement for #FaedahHijrah BRIsyariah as a Modern Retail Islamic Bank to work harder and smarter to be able to focus more in all fields and at the same time become BRI's mandate to continue to provide optimal performance for the community," said Widodo Januarso, Director of Retail Business at PT Bank BRIsyariah Tbk who received the award directly. Prima Network collaboration with PT Bank BRIsyariah Tbk includes ease of cash withdrawal transactions, balance checks, transfers and purchases (domestic debit) at more than 120,000 ATMs and more than 770,000 EDC machines connected to the Prima Network. Widodo said, strengthening digital banking is a priority of the company's strategy as well as a concrete step for BRISyariah to realize the company's vision to become a leader in digital banking implementation. "Alhamdulillah, BRIsyariah which is one of the subsidiaries of Bank BRI strives to continue to synergize for the progress of the country. We thank all the communities so that BRIsariah won this award. It is a shared responsibility to build Islamic banking in Indonesia as one of the economic driving forces. nation, said Widodo Januarso. Recorded during August 2018, BRIsyariah contributed to the syndicated financing of toll road projects through sharia contracts to PT Jasamarga Jalan Layang Cikampek (JCC), financing of Pertamina projects, BUMNs, Hospitals and other institutions. In addition, to provide convenience for customers in BRIsyariah transactions in collaboration with GO-JEK Indonesia in terms of providing top-up Go-Pay through BRIsyariah banks which have reached more than 52 thousand transactions. BRIsyariah also collaborates with the Payment Aggregator scheme together with PT. Rintis Sejahtera (PRIMA) in the form of online payments for all Tokopedia customers.